DAY 14 - 30DaysOfAvoToast: Sweet & Savory - AvoSeedo - Grow your own Avocado Tree! Most people typically enjoy AvoToast in a savory fashion. But guess what? In South America and Asia many people enjoy their avocado as dessert! For example avocados with condensed milk, sugar, and some ice cubes are very popular. Avocados also make a great ingredient for baked goods as either a butter substitute or main ingredient. Avocado chocolate mousse (as seen on day 8) or avocado chocolate ice cream are delicious! As we step into this new world of sweetened avocados we came up with a toast which is equal parts sweet & savory. 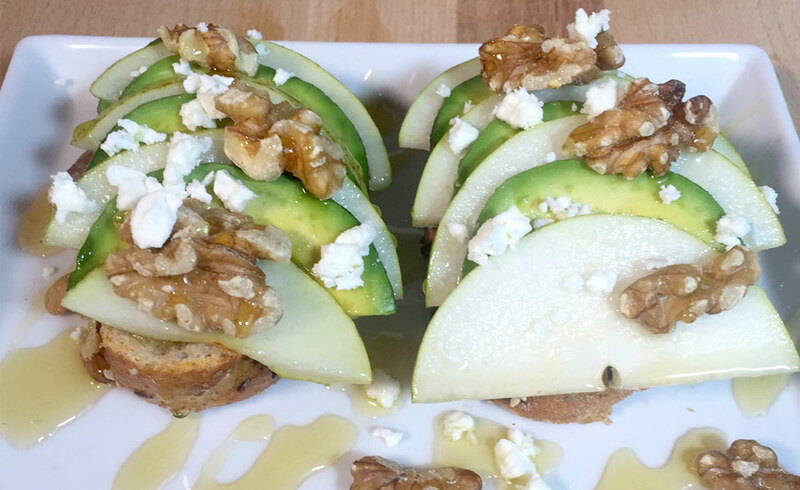 This entry was posted in Recipes and tagged Avocado, avocado toast, bleu cheese, honey, pear, savory, sweet, sweet & savory, walnut.